Nissan’s full-size sport utility vehicle hit dealer showrooms in August of 2003. The Nissan Armada immediately caught the attention of drivers who sought an affordable SUV, without sacrificing some of the luxury-inspired amenities. The Nissan Armada shares a platform with the Nissan Titan pickup truck, and Nissan Frontier pickup truck, helping it achieve a powerful name in the full-size SUV class. The Armada may look and feel pretty, but the SUV is a powerful workhorse through and through. For the 2015 model year, the Armada was given a slight refresh, offering more exterior options and standard features than the outgoing model. For drivers who want the power of the Armada, with a few luxury features, all without breaking the bank - the 2015 Nissan Armada SL is the perfect option. The 2015 Armada is a full-size SUV with lot of power, and a lot of comfort and convenience features. While the Nissan Armada did not receive a complete redesign for 2015 model year, it did get a few new standard and optional features added to its list. The new model still combines premium interior comfort, a wide range of technology, and unbridled power, which makes it a true stand out in it’s segment. When choosing an Armada, drivers have the option of deciding between three trim levels: SV, SL, and Platinum. Each offers its own unique list of standard features, with the SV being the base model and offering the least amount of features, and the Platinum being the top of the line model and offering the most upgraded features. The 2015 Armada SL sits happily between the two, and not only offers a long list of standard features, but also a great starting MSRP for the full-size SUV. Starting at just $43,500, the Armada SL positions itself nearly $5,000 over the price of the base SV model. With this price increase comes a completely new level of standard features, amenities, and technology. For the price, the SL offers the best overall value of the three trim level models. Check out what the 2015 Nissan Armada SL includes with its starting MSRP, that the Armada SV simply leaves behind. With everything that the 2015 Armada SL offers that the SV does not, makes the extra $5,000 added to the MSRP not only reasonable, but entirely worth the extra expense. For the busy family on the go, the Armada SV may not be properly equipped. The 2015 Armada SL offers the most standard features, for the best price. It is no secret that the 2015 Nissan Armada is a full-size SUV that is making waves in its segment. With a powerful engine, impressive capabilities, and a luxury interior, the Armada is not only turning heads, it’s also getting those heads behind the wheel. The exterior of the 2015 Armada is rugged in appearance, yet refined. The interior boasts seating for up to eight, with plenty of room left over to stretch out and store cargo. For those who need their full-size SUV to pull its own weight, the Armada steps up to that challenge as well. 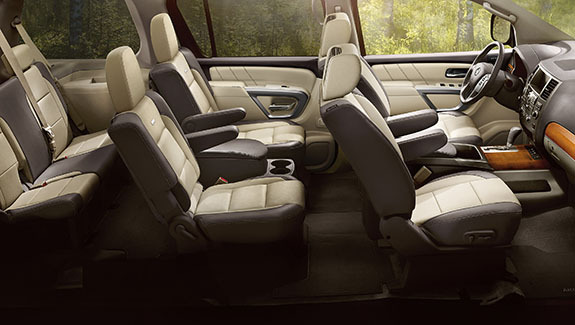 With three rows of seating, everyone who rides inside of the 2015 Armada will be impressed with the extensive room that each row offers. Power third-row seats become one with the floor, with the simple touch of a button. Heated front and rear seats help create the ideal climate for everyone on board, maximizes all around comfort for yourself, and your passengers. With all-around convenience, and a chrome/wood grain accented interior, the Armada has that luxury look and feel that drivers and passengers will love. Most impressive, however, is the large cargo capacity that the Armada features. With up to 97 cubic feet of cargo space with the second and third row folded down, the Armada can fit just about anything you need to bring along for the ride. The 2015 Armada features unmatched power with it’s massive 5.6-liter 32-valve Endurance V8 engine. With 317-horsepower and 385 lb.-ft. of torque, the Armada is as powerful as it is comfortable. Adding to that power is the brute strength that the Armada has with it’s up to 9,000 pound towing capacity. With a tow/haul mode setting, and an innovative auto-leveling rear suspension, Armada can get your boat to the lake with no problem. The full-size SUV gets an impressive 19 miles per gallon on the highway, making it as practical as it is powerful.